"What I’ve discovered is that success doesn’t come from will, talent, or tactics. Peak performers recognize something that everyone else do not. They’ve discovered that success is both a path and a process." After studying dozens of books and researching the areas of performance, psychology, emotions, and health + wellness, as well as interviewing dozens of high achievers across domains, I have distilled all the elements of high achievement into a high performance model for traders. 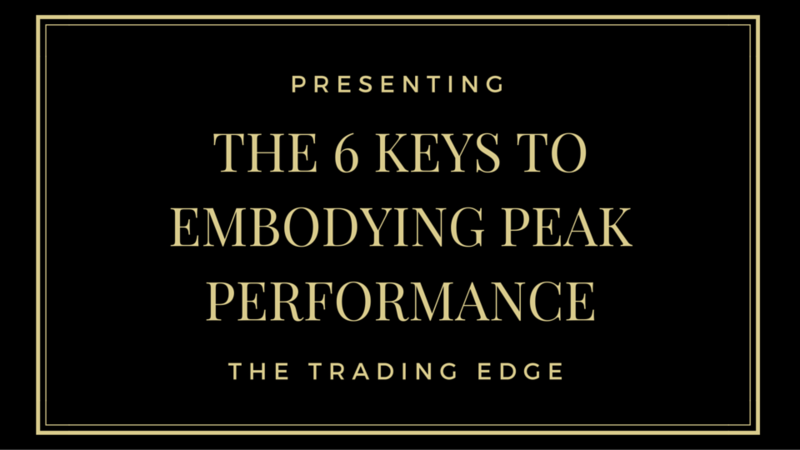 So if you're interested in going from "GOOD to GREAT" then The 6 Keys To Embodying Peak Performance is an accessible way to start you journey. In this course I will take you through these key concepts and share with your some practices and exercises which you can apply to your trading immediately. Here the thing, peak performers show up everyday. Everyday. It is consistency that makes their success inevitable and sustainable. Mediocrity on the other hand is built around the false belief that there's a finish line. That there exists a place or time when we no longer need to try. Where we've quote unquote "done enough" to earn our place. This place is a false summit. There is always another summit to climb. If you want to make a million dollars and you do, what then? Either your ambition will push you to desire more money, or you will realize that money was not really your goal. Either way, your climb doesn’t stop. There’s plenty more mountain ahead of you. The orientation of the peak performer is to show up everyday.